This is a very rare surname. We believe it to be French, indeed it is only in France that we have found any acceptable recordings. According to the Dictionnaire Etymologique de noms de famille de France, the development is from the word and surname Ami, meaning friend. This is recorded in many diminutive and patronymic forms including Amiot, Amyot, Amiel, Amiard, and Amiguet. 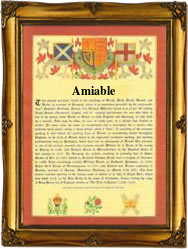 However Amiable whilst possibly deriving from Ami has a more distinctive meaning. It seems to have been a legal term which may suggest that the name could have been descriptive for a 'negotiator', perhaps one employed by the court and whose job was to find an 'amiable' solution to a problem. This however is conjecture as we have not been able to find any positive proof. Many, indeed the vast majority of early registers in France were deliberately destroyed during the famous Revolution of 1792 - 1796. At this time the church itself was exiled, and the insurgents regarded all records as tools of the secret police of the monarchy. As a result such early baptismal, marriage and death records as do exist tend to be erratic, and often found only in one area. We believe that it is possible that as according to the records, the surname is rare in France, it may be more popular in another European French speaking area such as Belgium or parts of Switzerland. An example of the recordings is that of Earnest Amiable and his wife the former Rosalie Quinot, who were witnesses at the baptism of their daughter Pauline Adelaide, at Allamps, Meurthe-et-Moselle, on November 25th 1855.